Steiner Ranch Friends & Family Turkey Trot – A Great Way To Start Thanksgiving! 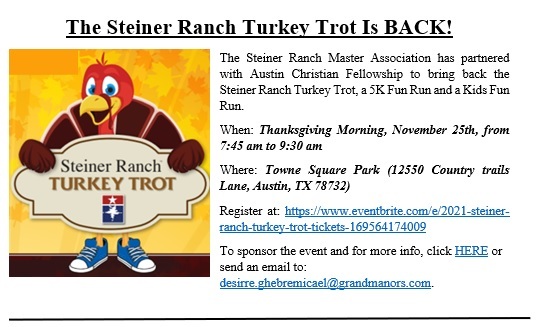 The Steiner Ranch HOA Event Planning Committee invites residents, their friends, and family to Steiner’s 2018 Turkey Trot! The event will begin at 8:00am on Thanksgiving Day at Towne Square, and will feature a 5k and Kids Fun Run. Run in a Turkey Costume for a chance to win a $50 gift card. Your registration will support a great cause – all of the registration fees collected will be donated to the American Red Cross to support those in need. Adult registration is $10, children under 10 are free. Much thanks to Austin Christian Fellowship for graciously co-sponsoring this neighborhood event with the Steiner Ranch HOA! Thank you to all the other sponsors that make the event a success. We hope you’ll join your neighbors, bring your family, and your friends, to what is sure to be a great start to Thanksgiving Day.